Today's Inspiration: "Mailing it in"
If that expression had existed in the 50's in its current context, Whitmore could fairly have been accused of "mailing it in" on this assignment. Short of asking the artist himself (and that won't be happening) its hard to imagine why this series for Cosmopolitan came out looking so crude. 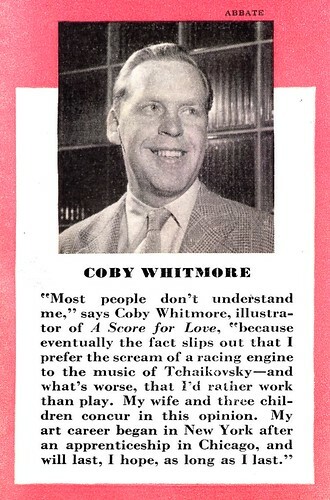 Especially when you consider Whitmore's love of sports cars and auto racing. 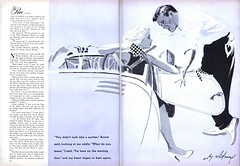 "I prefer the scream of a racing engine to the music of Tchaikovsky", says Whitmore in a Ladies Home Journal profile, and as if that weren't enough, the artist owned and raced a Jaguar XK 120 and was partners with an ex-WWII fighter pilot, John Fitch, in developing a concept car called the Fitch Whitmore LeMans Special. With the opportunity to paint not just a beautiful girl but a beautiful car as well, one has to wonder what the heck happened. 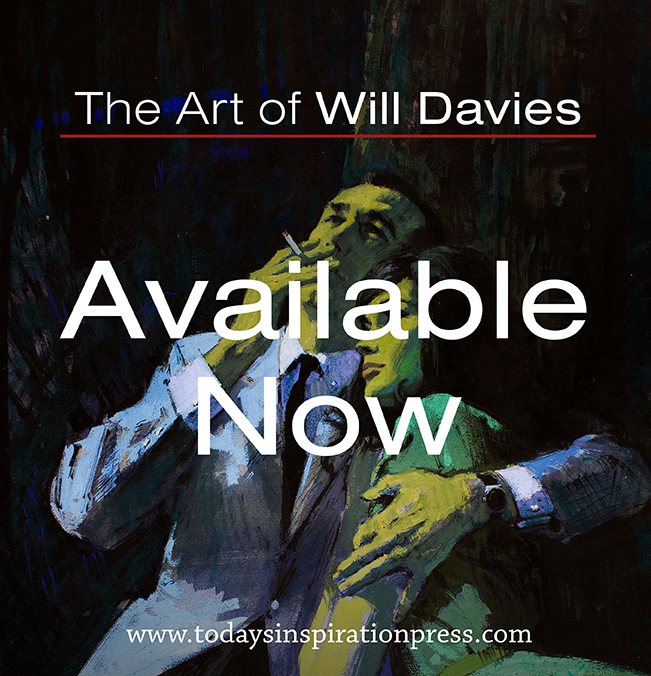 By now you might be wondering why I would even consider using this series for Today's Inspiration. True, its not terribly inspiring work. But I guess my appreciation for Whitmore's other better work makes me want to examine both the highs and the lows of his career. 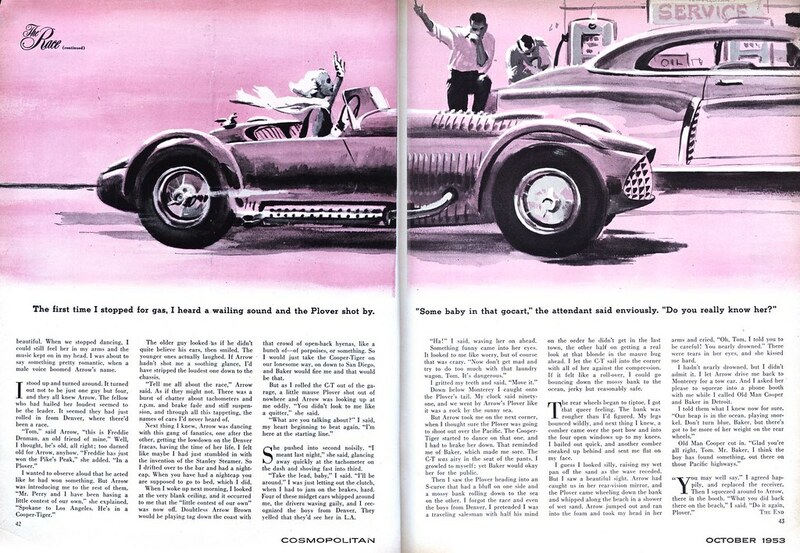 Also, this accompanying piece from "The Race" presents an interesting curiousity: the similarity between the composition of the Cosmo piece and this other, more accomplished work from around the same period for Saturday Evening Post. Two shots from the same roll of photo reference? 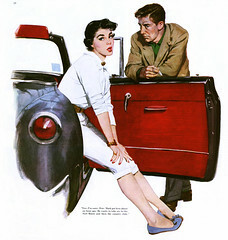 You can see these images at full size in my Coby Whitmore Flickr set. The last picture you included by Whitmore sure is a honey, and shows why-- even though Whitmore produced those first two dogs-- I prefer him (along with the great Joe de Mers) to Whitcomb, Bowler and other illustrators from that school. When he applied himself, he was superb.